Do essential oils grow hair ? The answer would be yes! Many of essential oils have a very good effect on hair growth. They stimulate the hair follicles to grow faster. What causes hair thinning or falling out? 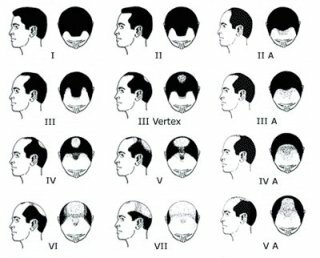 It may be caused by stress, medications, hormonal changes, Alopecia, or other undiagnosed medical conditions. Your hair is like a health barometer and can be affected by diet, illness, medication and environmental factors. Aromatherapy has been used successfully by some people to treat thinning hair and bald patches. Some essential oils can also stimulate the hair follicles and help promote healthy hair growth. You can make an aromatherapy infusion that you apply directly to your hair, or create a hair and scalp massage oil. An additional hair treatment can be made by adding herbal essential oil to your shampoo or conditioner. This is a very simple way to create a wonderful product that works wonders on your hair. What are essential oils that can help grow hair? is a beneficial herb that stimulates and promotes hair growth. One can easily make Basil hair oil to massage into the scalp. This massage promotes healing, health, and improves scalp circulation which, in turn, promotes hair growth. Basil is good when used together with fenugreek and ivy burdock herbs. has effect in stimulating the hair-bulbs to renewed activity and preventing premature baldness. A hair rinse prepared with arnica extract has been used to treat alopecia neurotica. A strong infusion of sage used as a hair rinse may darken hair color and help reduce hair loss. helps your hair grow. If you have dull hair, this essential oil can restore it. It is also good for dandruff problems. For stimulating your hair health you can add three drops of bay essential oil to the shampoo you regularly uses. The best carrier oil to choose would be jojoba oils. has healing properties for damaged and breaking hair. This truly is one of the best carrier oils for hair loss due to breakage. You can try by adding 4  10 drops of essential oils mention with 1 ounce of jojoba oils or other carrier oil of your choice. Heat the hair oil by placing the bottle of oil in a bowl of hot water. Apply the oil to the scalp and massage through the rest of the hair. Blend well in an amber bottle and massage a few drops into your scalp at night or apply them on your hair brush and brush your hair thoroughly. Mix thyme, cedarwood,lavender, and rosemary essential oils well in a small glass jar. After that add the remaining carrier oils. Mix thoroughly. Massage this recipe into your scalp for at least two minutes every night. Wrap your head in a warm towel after treatment to enhance absorption. Isabelle C. Hay and colleagues from the Aberdeen Royal Infirmary in Scotland tested 84 people, suffering from alopecia areata, a type of hair loss that causes patchy baldness. They asked them to rub the essential oils recipe above into their scalps daily. After seven months, 44% of them regrew as much as half of their hair, while a few regrew almost all of their hair back. Reference: Hay I, et al. Randomized trial of aromatherapysuccessful treatment for alopecia areata. Arch Dermatol 1998;134:1349-52. Click here for further reading. Personally I would suggested to use this blend recipe by massage it into your scalp once daily, leave on the scalp for an hour before wash it. Take the blend for about 2 weeks, then take a week break before restarting again. By using pure essential oils that promote hair growth, you may soon see that your hair becomes thicker, more luxurious, and radiant. The essential oil acts effectively in increasing blood circulation to the scalp area. The condition of the scalp determines the condition of the hair, healthy scalp equates to healthy hair. Essential oils will help reduce excessive production of sebum, the oil produced by the skin, to help promote healthy hair growth. Excessive sebum will lead to development of wax like layer preventing the growth of the hair and if it does grow the hair growing is brittle. This hair type is likely not to withstand the harsh environment on the outside. Essential oils, other than regulating skin oil production, helps clean the scalp of dead skin tissues and other acquired pollutants from the environment. Increased blood circulation caused by the application of the essential oil(s) will help oxygenate the cells of the scalp. Increased oxygenation will help nourish the cells of the entire body. Another quality that these essential oils have is its ability to promote cell regeneration. Additionally the topical application of these oils will penetrate beyond the epidermis getting to the stratum basale where new skin cells are being produced. These oils are compatible with the outer skin layer of our body that is absorbed by it, that is composed of protein called Keratin. As described, it gets beyond just the outer layer of both hair and skin. With this unique characteristic, it is essential oils and few others that can truly promote the repair of damaged hair. Many scalp conditions affect hair growth so the use of essential oils that has qualities like antiseptic, anti fungal and anti-inflammatory will help treat the conditions and promote healthy hair growth altogether. Do essential oils grow hair ...in children too? "Do essential oils grow hair"
There is a prevalent alopecia areata in children and many of the parents seek treatments that will offer a solution with the least side effect, and many are considering alternative way using essential oils to treat this condition. Though there are essential oils that are generally recognized as safe, but to use them on children is highly cautioned. It is important to understand that though lavender is safe to use on children in minimal amount but essential oils like cedarwood, rosemary and thyme are not to be used on children of certain ages. There are Thyme variations and chemo-types that should never be used on children in certain age. These essential oils have the qualities related to hair growth and pacifying negative emotions resulting from alopecia areata. Logically as a child grows in age the range of the essential oils that can be used broadens. Essential oils like geranium, frankincense rosemary, marjoram and cypress may then be used as a component of an essential oil blend with the right proportion in carrier oils. Related post to "Do essential oils grow hair?" If you have a severe problem of hair loss, I suggest you read Hair Loss in Women. This book was written from the authors experience when she was having hair loss problems since she was a child. This is her story. It is a truly amazing book. Disclaimer : This "Do essential oils grow hair" article is designed only for educational and information purposes. aromatherapy-at-home.com does not warrant or assume any legal liability or responsibility for the accuracy, completeness or usefulness of the information provided here. Please consult your own physician and medical advisors.